Democratic congressional candidate Alexandria Ocasio-Cortez speaks at her midterm election night party in New York City, Nov. 6, 2018. Rising left-wing rock star Alexandria Ocasio-Cortez made history on Tuesday as the youngest woman elected to Congress, in a safe Democratic Party stronghold in New York, U.S. media projected. The 29-year-old has championed her working class and Puerto Rican roots, moonlighting as a bartender until defeating a Democratic grandee in a party primary earlier this year, capturing imaginations around the country. 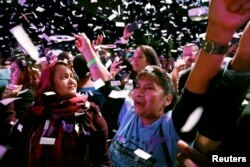 On Tuesday, she trounced Republican opponent Anthony Pappas in her constituency, a Democratic stronghold in a diverse part of Queens and the Bronx, U.S. media reported. Her win beats the previous record held by Republican congresswoman Elise Stefanik, a former White House aide to president George W. Bush who was first elected to an upstate New York constituency in 2014 aged 30. Adrian Avella and Mazeda Uddin react during the midterm election night party of Democratic congressional candidate Alexandria Ocasio-Cortez in New York City, Nov. 6, 2018. Before that, the last record was last set by former Democratic representative Elizabeth Holtzman in Brooklyn, who won a seat in the House in 1972 when she was 31 years old and took her seat in 1973. Women occupy just 23 percent of the seats in the current U.S. Senate and 19.3 percent in the House of Representatives, comparatively low rates in the developed world.